When madewell came out with its fall catalog, I mentally put this on the top of my wishlist. I placed my order for this sweatshirt weeks ago, but it only came last Friday, and I didn’t have the chance to wear it until today. One wear in, and I’m in love. It’s super soft, and the black-and-white color scheme is right up my alley. It has that perfect slightly slouchy fit that seems so simple but not always the easiest thing to find. 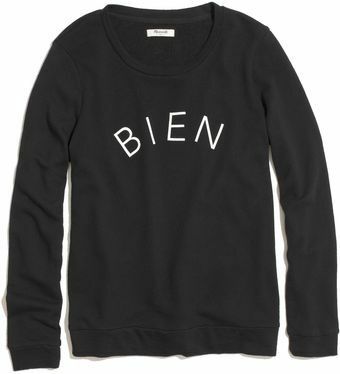 I love easy pieces like this that have a cute or interesting detail to keep them from being too plain (on the reverse is the word “fait”… bien fait = made well/well done…how cute is that? ).